Today, a US$40 million loan was signed between the Government of Belize and the OPEC Fund for International Development (OFID) for the Caracol Road Upgrading Project. Prime Minister of Belize Rt. Hon. 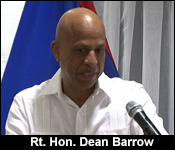 Dean Barrow signed on behalf of the Government of Belize and Director-General H.E. 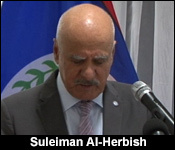 Dr. Suleiman Al-Herbish signed on behalf of OFID. Under the Caracol Road Project – Phase 1, approximately 45.5 km (26.4 miles) of graveled road will be upgraded to an all-weather, paved standard. Five double-lane reinforced concrete bridges will be constructed within this phase. Additionally, the Georgeville and Santa Elena access roads to the Caracol archaeological site will be upgraded as well as an additional 9 km from the tripartite intersection. This transport sector project was appraised by the OPEC Fund for International Development and presented to its board of directors who approved the loan to the Government of Belize at the end of 2016. Procurement of supervision consultants and construction contractors will now commence. And while the city government hopes to pave that major street in Lake Independence, Central Government today signed off on a most ambitious road project in the Chiquibul. It’s the Caracol Road upgrade project. The loan motion for the project was tabled at the senate last month, and, now, it will finally become a reality. Today the Government of Belize and the OPEC Fund for International Development signed off on the $40 million US project. With this road upgrade agreement, about 26.4 miles of gravel road will be upgraded to an all-weather, paved standard. Five double-lane reinforced concrete bridges will be constructed and the Georgeville and Santa Elena access roads to the Caracol archaeological site will be upgraded. At the signing in Belmopan, The Director- General of OFID along with the Prime Minister spoke on the benefits of this collaboration. "The loan agreement we are going to sign will be a well-established framework of cooperation between OFID and Belize which has reached 1.4 million dollars. To recognize the importance in critical situation of transport infrastructure in Belize OFID has directed really to the volume of assistance towards enhancing the transport system of the country." "There are all sorts of highlights to this program that over the years we can point to. Naturally there has been a huge concentration on road infrastructure, the director general made the point that connectivity is key but certainly for people in Belize City there can be no ignoring or downplaying of the fact of that Southside poverty alleviation project. The current new agreement that we're about to sign is of course going to be even though there is a lot of competition; going to be really the headline grabber with respect to our continuing program opening the road to Caracol, rehabilitating that road, upgrading it - making it an all-weather road is going to a monumental achievement, a tremendous leap forward for this country. In terms what it's going to mean with respect to tourism and also to agriculture. The contribution that the Kuwait Fund is going to make to the Caracol Road and we once more place on record our tremendous gratitude to you, tremendous gratitude to the officials of the Kuwait Fund." As you heard, the Kuwait Fund is a major contributor in this project.